Go for a shopping 2 blocks away, or take your kids for a walk in a nearby park, or walk your dog for an hour…selecting a proper transporter for short trips has always been a headache. Compared with ordinary transporters, what difference does the intelligent self-balancing scooter (www.airwheel.net) make to stand out as the most popular personal transporter today? With the ever-changing situation of age, work and family, people begin to notice their various transportation demands, which can not be simply satisfied by a private car. For most core families, an intelligent scooter is a perfect compensating choice for leisure trip or shopping, they’re meant to cover the last few miles in lieu of cars. With the sleek exterior design and superior performance, the self-balancing scooter will be and ideal family commute partner. 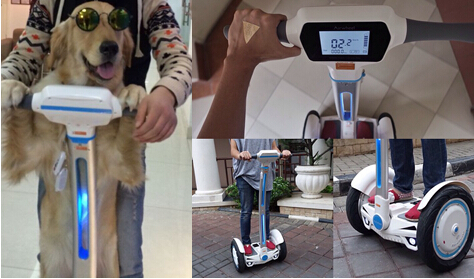 Take Airwheel 2-wheeled electric scooter as an example, its impressive bright white-blue color matching catches my eyes at the first glimpse. The sportive front design of S3 is inspired by Lamborghini, which wins it almost 100% second glance rate. In addition, the S3 features distinctive front and rear lights, plus the dashing LED atmosphere lights on the control shaft and handlebar to ensure safety at night. The innovative combination of lights adds to the premium essence, and the streamlined contour from the handlebar to control shaft, foot platform and wheel base presents a comfortable outline. In consistence of Airwheel’s premium quality and exquisite craftsmanship, S3 is configured by hi-tech nano-plastic casing and cutting-edge magnesium alloy, which is light and solid. The control of dead weight is crucial to build a handy and portable self-balancing scooter. In addition, the self-balancing scooter S3 boasts superior performance highlighted by a magnified LED display, which shows real-time driving data such as mileage, speed, battery level and temperature. The self-balancing scooter S3 is powered by a super powerful maglev motor and equipped by dual battery protection boards. In case of any failures during riding, the backup board will take over immediately to prevent further malfunction and risks. Airwheel S3 weighs only 22.4kg, which suffices to be an ideal portable transporter for a short trip to supermarkets, parks or a walk of your dog. Afraid that your dog will get tired of chasing S3? Just hold him to ride with you!